What Kate Baked...and baby! : Happy Birthday What Kate Baked! Two weeks ago, completely missed by me, What Kate Baked was two years old. Two whole years of baking, seven hundred and thirty days of owning way above average the amount of recipe books most people require to live a happy (and full) life and 17,531 hours of eating way too much cake. 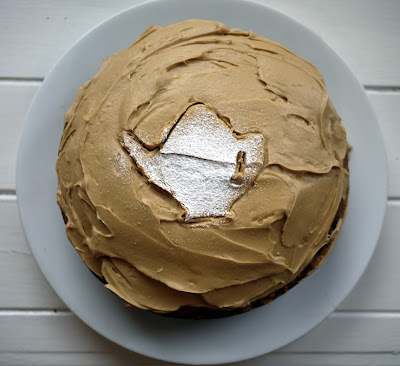 I wasn't sure whether to mark this anniversary with a 'Best Of...' compilation (too self-indulgent), baking a monstrous second birthday cake (I ran out of time), writing a review of the year ('this year I ate a lot of cake') or just say a big thank you. I plumped for the fourth option. So, Oscar-style, with my best apron on and using a wooden spoon-microphone I'd like to say a big huge thank you to everyone who takes the time to read and comment on my little blog. It means such a lot. It can be a lonely business this blogging lark. Dreaming up new recipes when unable to sleep at night, wondering which friend to foist yet another cake upon and tap-tap-tapping away on the laptop wondering 'does anyone even give two hoots that this orange cake is is easily digestible with a touch of laryngitis?'. So thank you for reading my random ramblings and saying such lovely things. Of course, with What Kate Baked now being two years old, am I to expect the 'troublesome twosome' years? Disastrous cakes and spelling mistakes? And compared to some of the far more long-standing food blogs, two years of blogging is but a crumb in a gigantic croquemboiche. Anyways, here's a cake to celebrate. 1. Preheat the oven to 180C/350F/Gas Mark 4. Grease and line two 20cm sandwich tins. 2. Weigh the eggs (in their shells) and weigh out the exact same amount each of the butter, sugar and flour. Beat together the butter and sugar for 7-10 minutes until light and fluffy. Gradually add in the eggs and vanilla. If the mixture begins to curdle, spoon in a little of the flour. Fold in the flour gently until combined. The mixture should be of dropping consistency. If not, add a splash or two of milk. 3. Divide the batter between the two prepared tins and smooth the tops. Bake for 25-30 minutes until golden in colour and a skewer inserted in the centre comes out clean. Set aside to cool in the tins for five minutes before removing onto a wire rack to cool completely. 4. To make the icing: beat together the butter, spread and icing sugar until thoroughly combined. Add a splash of milk if required. Use half the icing to sandwich together the two layers and spread the rest over the top of the cake. Using a biscuit cutter in the shape of a teapot and a dusting of icing sugar I created the decoration- can you tell what it is?! The Speculoos spread was purchased on that epic French supermarket sweep. But is also available in many large British supermarkets, particularly the one rhyming with Baitpose. Happy Birthday and I am glad you chose the 4th option. Looks delicious! Happy Birthday to your delicious blog! I hope you avoid the "terrible" twos!! Happy belated blog birthday Kate! This has reminded me that I have also forgotten about my 2nd blog birthday! I think it was last month(...?) Here's to more years of happy baking and cake eating! And many happy returns to the kitchen! Happy Birthday. So glad you take the time to write a blog - I forgot my first birthday too! I agree you do wonder if anyone out there is reading the ramblings or making the recipes, but let me assure you even though I don't always comment or bake I am very happy and interested to pop by and see what's going on in your kitchen. 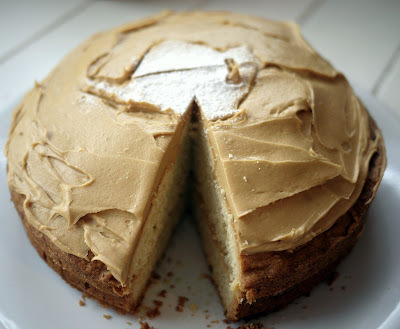 Happy birthday to Kate to you and your blog :-) The use of Speculoos spread is quiet interesting. I was first introduced to this fabtactic spread (or liquid biscuit as I call it) 3 weeks ago at a breakfast in Belgium, and I becoming more and more addicted to this spread. Happy second birthday...you don't look a day older! Great choice of cake to celebrate. Happy Blog Birthday, hope the coming years are filled with as much delicious baking as the past ones! Happy Birthday to your blog and I love your choice of cake. It was through blogging that I discovered the joys of Speculoos and my blog is also about the same age as yours but I am terrible in remembering/celebrating it! I love your blog and have nominated you for a versatile blogger award. Happy 2nd Birthday - this looks delicious!